World famous sweet from Agra, Uttar Pradesh. Made under controlled hygienic conditions from quality ingredients. Not only it is delicious and contains fruit fiber, it is also very healthy. It has various health benefits. 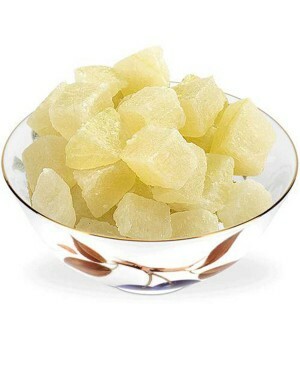 Dry Petha is the world famous sweet of Agra, India. Dry Petha is made from fresh white pumpkins and use of quality ingredients like sugar and essence of kewra brings out the true picture of originality and freshness in taste. It is the very basic variety of Agra's Petha and is most liked by people. Petha from Agra, India is world famous. It is made by drying pieces of ash gourd in lime water, then cooking these pieces in sugar, which adds to its sweet flavour while acting as a natural preservative. Not only it is delicious and contains fruit fiber, it is also very healthy. Petha contains iron, calcium, sulfur, and Vitamins A, B, C, and E, as well as protein.